This project involved an investigation of the semiotics of a person whom I admire. 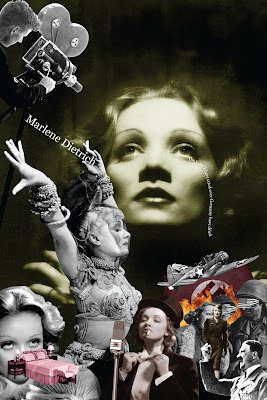 Marlene Dietrich was a dangerous woman known for following through with her passions. She tested gender rolls while romancing the masses; also during WWII, she fiercely longed for Hitler to be defeated. 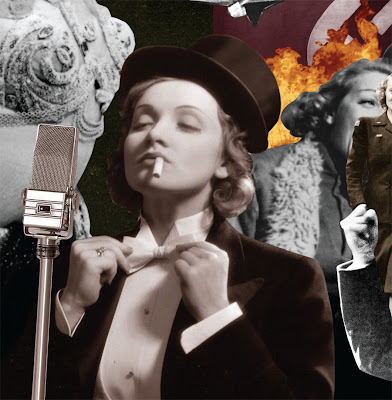 In Berlin, the place of her birth, Dietrich achieved fame as a actress and cabaret dancer. In 1930, her fame exploded with the release of a movie titled, Morocco, where she played an androgyonous character who dressed in men’s clothing and referred to Gary Cooper as her girlfriend. 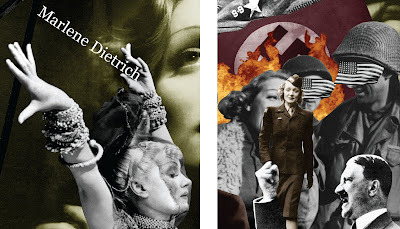 During WWII Dietrich became a U.S. citizen in response to her disgust with Hitler. She entertained U.S. troops and even joined the U.S. military. Upon being approached by Hitler’s associates to return to her country of origin, she declined. Her movies were then banned in Germany. (above) I chose bedroom eyes, as a symbol of Marlene Dietrich, since she was a romantic who seduced the masses with a glance. The bed is laced with one of her quotes (that would make my conservative mother cringe), I am at heart a gentleman. The WWII (montage within a montage) above on the right, is an index of her devotion during the war. This is a picture from her 1930’s film, Morocco. I feel that the characters she played in these movies are not only icons but potential indexes of personalities she has once embodied.